I spent a few days last weekend riding near Graham, WA while visiting some family that live over there and came away that much happier to live here in Spokane. The neighborhood where my wife’s sister and her family live is a mix of semi-rural private roads and isolated suburban neighborhoods. It’s a nice area with great views of Mt. Rainier, but very much a product of the cheap gas era and not really bike friendly at all. 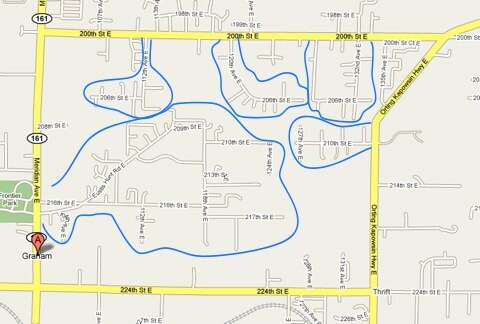 Case in point here’s a map of the area I did a lot my riding around. Note the lack of connecting streets between the neighborhoods in this three to four square mile area. Everything seems to be geared towards isolating houses and neighborhoods and pushing all the traffic out to the four roads along the periphery. Meridian to the west is basically what Division would be like in Spokane if there were no other arterials like Market, Nevada, Wall and Maple to share some of the north-south traffic load. Completely unbearable to drive on when you want to head north of 200th towards Puyallup, but at least it has decent paved shoulders if you’re on a bike. On the east side the Orting – Kapowsin Highway would be pretty pleasant to ride on except it completely lacks ridable shoulders and has lots of large dump trucks traveling on it during the week. 200th was okay to ride on, but the shoulders had rough pavement so I tended to stay on the road more. 224th was a little better actually with slightly less traffic and a better surface. On my last day I decided to break away from just riding the big loop and do a little exploration on a couple of the roads that weren’t actually labelled as private. Turns out they just weren’t properly labelled, every road within that area is private and riddled with enormous speed bumps between almost every house. Since these private roads don’t actually lead anywhere and the only place you could speed to is to your house further up the road I can only presume that there isn’t a lot of neighborly love going around. I mean if you liked and respected your neighbors you wouldn’t be speeding by their houses on the way to your house would you? 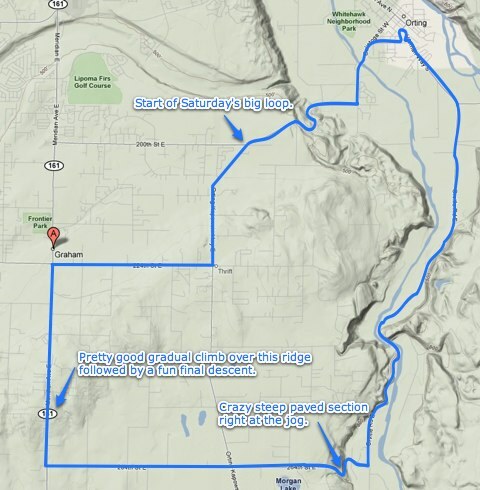 Lest you think I was completely bummed out by my riding in the area, I must state that I did have a really good ride on Saturday when I went down the hill on the Orting – Kapowsin Highway and into Orting. It’s a little more rural and the valley there is pretty scenic and pleasant (just don’t get caught there when Mt. Rainier finally blows as the predicted mud flows are going to wipe everything out). I also discovered the route I had planned out had a bunch of Dan Henry’s marking someone’s bike route (possibly a brevet of some kind?) so I knew I was on the right track. I followed the road all the way to my planned 264th street turn and climbed the hill back onto the plateau. There was a surprisingly steep paved switchback jog right before the top. I was in the lowest gear on my second chainring and my front tire was actually lifting a little bit with every pedal stroke as I finished the hill off. If it had been gravel there I might have had to walk at that point. 264th basically passes through rural farmland and was very nice riding. I think I passed exactly one car and one horse and rider before I got to the Kapowsin – Orting Highway intersection. The Dan Henry’s turned south on the highway while I continued onto Meridian. I had a nice final climb up Meridian before coasting my down to familiar territory around 224th. I decided to turn right on 224th to get off Meridian and bring my total distance over 40 km for the day and it ended up being a good way to go. My final on bike time for the day was just over 1:48 and my average speed just under 23 km/h. In the future I would like to explore further south and follow those Dan Henry’s further or maybe make the ride from Graham through Yelm to Olympia where my brother lives but those rides will have to wait until our next visit. With as little travelling as we do that’s probably not going to happen until next year, but maybe by that time I’ll have a new long distance/rando bike to bring along as well. I’m looking forward to it already.